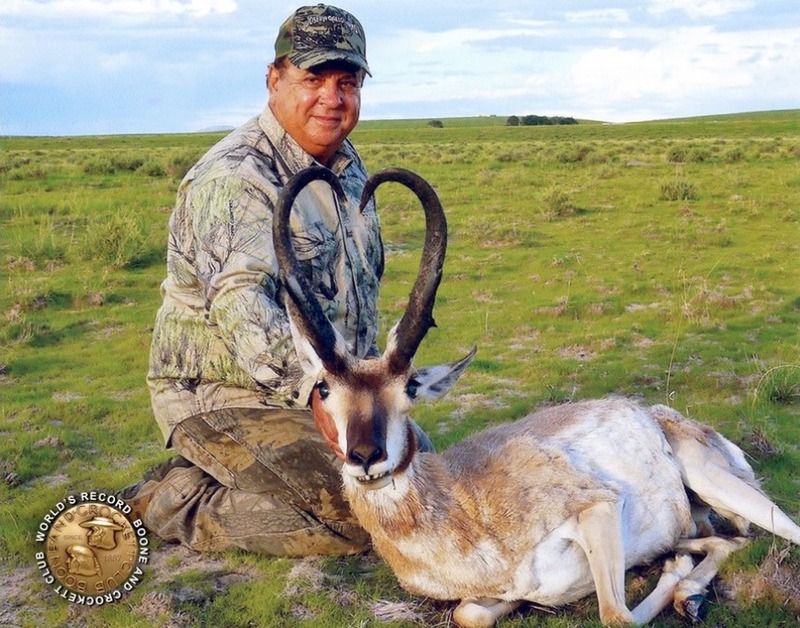 Hunter Mike Gallo poses with his new World's Record pronghorn that officially scored 96 4/8 B&C points. MISSOULA, Mont. – The largest pronghorn ever recorded has been certified by Boone and Crockett Club as a new World's Record. The huge buck, hunted in Socorro County, N.M., in 2013, scores 96 4/8 B&C points. The new record breaks a tie between two specimens from Arizona. One was taken in Coconino County in 2000, the other in Mohave County in 2002. Both scored 95 B&C points. Club officials say the difference between these old records and the new – a full inch-and-a-half – is an extraordinary jump. In fact, the margin between the now No. 1- and No. 2-ranked trophies is the largest in Boone and Crockett pronghorn records, which contain more than 3,400 entries.The outstanding trophy also marks a notable achievement for conservation professionals.Boone and Crockett records are a gauge of exceptional habitat, strong recruitment of game animals into older age classes, sustainable harvest objectives and other elements of sound wildlife management and fair-chase hunting. "Records reflect success in big-game conservation," said Richard Hale, chairman of the Club's Records of North American Big Game Committee. "Remember, the pronghorn was once nearly lost, much like the bison, until sportsmen led an era of wildlife recovery. Now the species is flourishing. And the fact that such incredible specimens exist today says a lot about how far we have come, and how bright the future might be." Forever attached to the new World's Record pronghorn is the name of the lucky hunter: Mike Gallo.Hale added, "Congratulations to Mr. Gallo on a tremendous animal and a tip of the cap to the New Mexico Department of Fish and Game and to the sportsmen and sportswomen of that state for their stewardship of this iconic North American species." Lengths of horns: 18-3/8 right, 18-4/8 left. Total mass: 23-3/8 right, 23-2/8 left. Lengths of prongs: 7 right, 6-5/8 left. Overall, New Mexico is second in pronghorn entries in Boone and Crockett records, with 627. Wyoming is first with 1,154. Rounding out the Top-5 are Arizona (339), Nevada (288) and Montana (183). When North America's early explorers first described pronghorns, their journal entries referred to the animal as a goat. A second misnomer – antelope – appeared later when an observer noticed the similarities between pronghorns and African antelopes. By the time biologists discovered this species actually is neither goat nor antelope, both misnomers were in common use. Today, the pronghorn is known as a unique species whose entire evolutionary path and distribution are exclusive to North America. North America's first hunting and conservation organization, the Boone and Crockett Club was founded by Theodore Roosevelt in 1887. Its mission is to provide the leadership, stewardship and education needed to promote the conservation and management of wildlife, especially big game and its habitat, to preserve and encourage hunting and to maintain the highest ethical standards of fair chase and sportsmanship. Join us at //www.boone-crockett.org.